Browse mode doesn't show folders with non-ASCII characters. Ubuntu 11.04, Acer Aspire 5315, Linux 2.6.38.13.
han desaparecido,(Mixxx 1.10 library.png) me refiero a las carpetas situadas en: Examinar/Enlaces rápidos/Biblioteca Mixxx. En la version anterior podia verlas perfectamente. En cambio si que puedo ver las canciones en Biblioteca(Mixxx 1.10 biblioteca.png). I had installed Mixxx 1.9.2 via PPA and eveythink was ok, when mixxx updated to 1.10, the music folders in browse/quick links/mixxx library have gone. 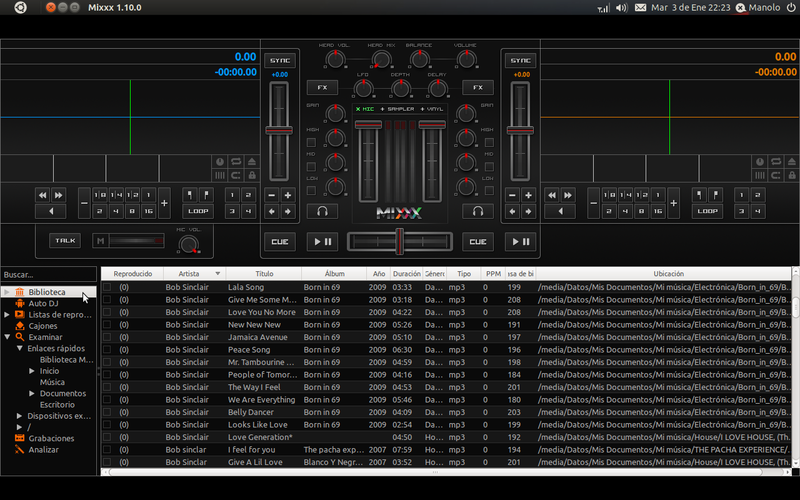 However I can see the songs in Library(up to autodj). Also tell than the program now is in spanish(like the sistem)wich is very googd. 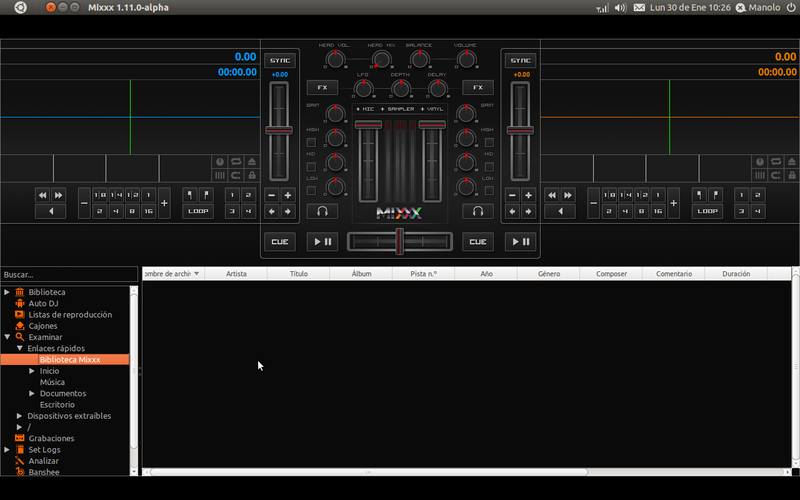 Could you post the log output of Mixxx when you click on the Home/Biblioteca section? which one is and where is located, remember I'm using ubuntu 11.04.
the same external HD where the music is located and works fine. Thank you very much and once again sorry about my English. Could you confirm the name of your music folder? Is it /media/Datos/Mis Documentos/Mi música/ ? Documentos/Mi música for media/Datos/Mis Documentos/Mi musica. Thank you very much, and happy Mixxx. Well, renaming it will work, but Mixxx also has a problem because you should be able to use accented characters in your filenames. Renaming to 'Mi musica' is a good workaround, but we'll get the actual problem fixed so that 'Mi música' works as well. quick link doesn't work(see quick Link.png).Now I'm working on it. change something in the name of the Playlist, etc. > so that 'Mi música' works as well. + Browse mode doesn't show folders with non-ASCII characters. 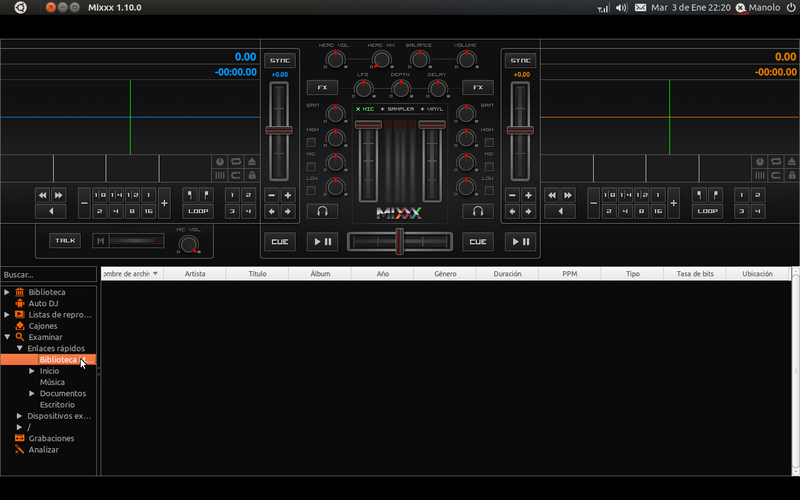 I cannot reproduce the problem wit Ubuntu 11.10 and lp:mixxx. The attached patch forces to handle the config file as UTF-8. This patch is needed for Windows to store characters that are not in the local latin. 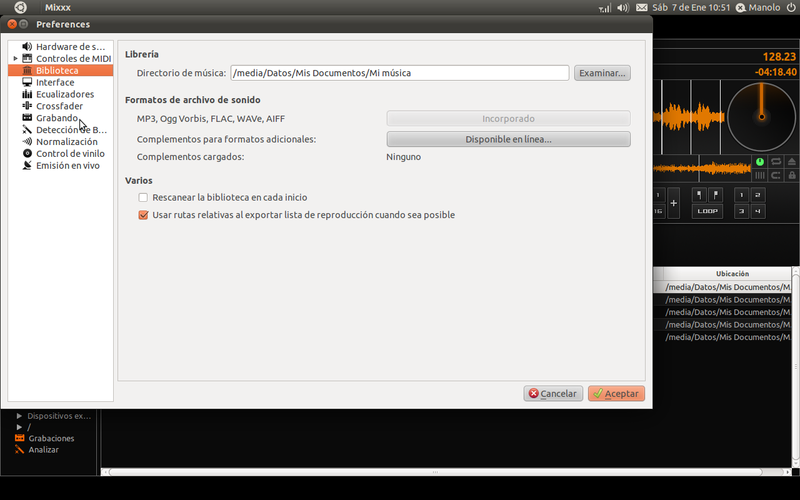 On Ubuntu Qt should handle text files as UTF-8 as default already. So this might not be the problem but is worth a try. Note: The qDebug function prints has a bug with decoding QString to UTF-8. Both Strings "Enlaces rápidos" and "Música" are double UTF-8 encoded in your case. But your screenshot shows "Enlaces rápidos" correct, just as in my case. I guess that the double UTF-8 encoding was happen on the way to launchpad. Can you provide your ~/.mixxx/mixxx.cfg file? Yes, you're right, I didn't see that before(Enlaces rápidos). to look for a solution to this. perfecto; en cambio en un SO Windows funciona con acento. 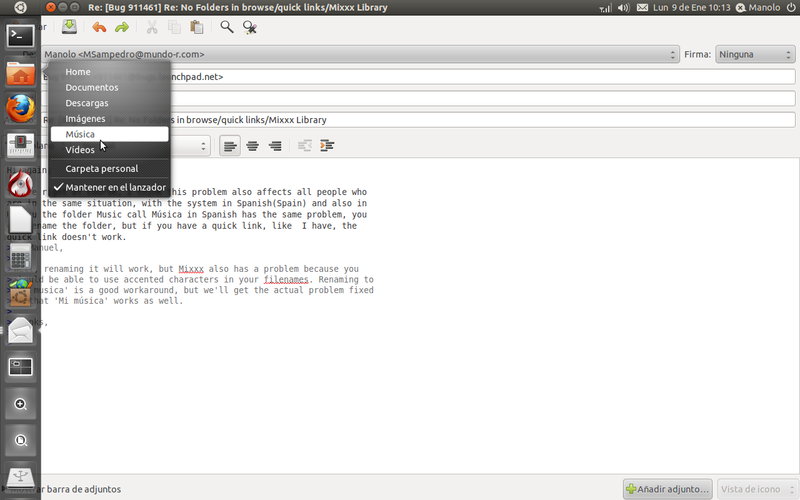 > I cannot reproduce the problem wit Ubuntu 11.10 and lp:mixxx. > already. So this might not be the problem but is worth a try. > Can you provide your ~/.mixxx/mixxx.cfg file? > ** Patch added: "ConfigUtf8.patch"
I have added additional debug messages that may help and bug #917908 "qDebug UTF-8 encoding problem" is solved. Note: Mixxx 1.11 introduces a new database schema V 14. So its a good idea to backup your original ~/.mixxx folder before. Please provide the mixxx.log when you hit the bug. Documentos/Mi música to: /media/Datos/Mis Documentos/Mi musica. > I have added additional debug messages that may help and bug #917908 "qDebug UTF-8 encoding problem" is solved. > Note: Mixxx 1.11 introduces a new database schema V 14. So its a good idea to backup your original ~/.mixxx folder before. > Please provide the mixxx.log when you hit the bug. Yippie! I have managed to reproduce the issue. The difference was that you had no Tracks in the root folder but in the sub-folders that where not displayed. The attached Patch solves the problem! Can you explain me how to apply the patch; I'm not a professional. > The attached Patch solves the problem! > ** Patch added: "brows.patch"
for me they are working. It looks like you had an issue with line brake in the email notification. Please try again. Hi Daniel, just tell you thank you very much for your work. Another good fix -- thanks Daniel! Is this issue supposed to be solved in the current source code release (my mixxx say it's 1.11.0-beta2-pre)? I'm experiencing a problem similar to the one described above: files and folders with (some) accented characters are not found when scanning the library or when browsing. Apparently those file names contain characters that are invalid in UTF-8 (that's what Nautilus says). I assume they are leftovers from pre-UTF-8 times. However, the file names display correctly in xterm and my music library and my playlists work fine with other players. I don't really know what I should send you to help reproducing the problem. Maybe an excerpt of a playlist so that you can create files with names that don't work in my Mixxx? Can you please open a new Bug, since this one is already fixed an released.